In what is a first, the Elk Grove Planning Commission approved a conditional use permit (CUP) tonight for the city's first tattoo parlor. 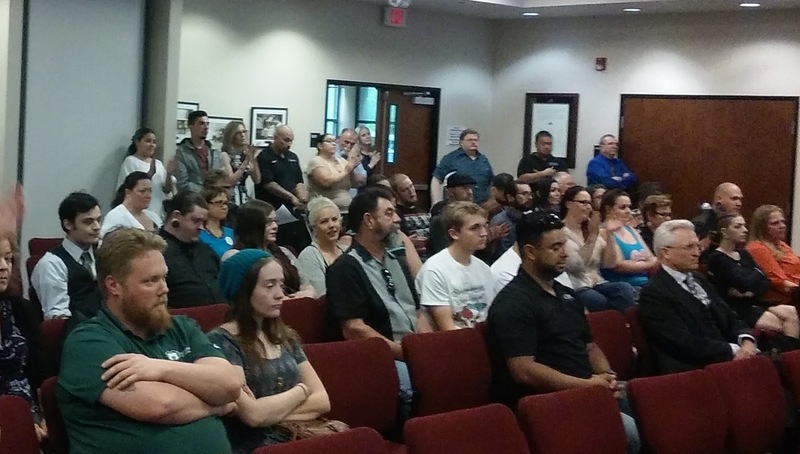 Before a standing-room-only crowd at the Elk Grove City Council Chambers, the planning commissioners gave a unanimous thumbs-up to the application for Emerald Tattoo and Piercing to open for business. The new establishment is located at 9410 Elk-Grove Florin Road in the Grove Shopping Center. Leaving nothing to chance, Emerald Tattoo and Piercing owner Josh Hughes filled the chambers with over 50 customers and character references, 20 or so of whom testified on his behalf. The mix of supporters who spoke during public comment - both tattooed and non-tattooed - included a Certified Public Attorney, an Attorney, two restaurant owners, a retired California Correctional Peace Officer, an Elk Grove student guidance counselor, his landlord from his two other shops in Lodi and Modestor and an Iraq War combat veteran. Typical of the supporters was Christine Peterson, head counselor of Elk Grove's Elizabeth Pinkerton Middle School, who said she was happy to speak on behalf of Hughes. Peterson said Hughes was a featured speaker to a group of at-risk children at the school and helped point them in the right direction. "He is a great part of the community," Peterson said. "And I think having him here in Elk Grove will get better things going on." Peterson, who said she is a melanoma survivor, added "that I am an Emerald Tattoo customer myself" and was satisfied with his shop's health standards. Under city code, tattoo parlors are classified in the "Personal Services, Restricted" category, and before opening, they must obtain a CUP. Other types of businesses in this category include fortune tellers, psychics, palm readers and cash checking services. The code further states these types of businesses must obtain the CUP because they are "establishments that may tend to have a blighting and/or deteriorating effect upon surrounding areas and which may need to be dispersed to minimize their adverse impacts..." During their deliberations, Commissioners Sparky Harris, Frank Maita and George Murphey addressed that phrasing saying it was not intended to target this applicant or clientele per se, but rather a mechanism to keep questionable operators from opening for business in the city. "The fact that Josh chose to lay out his hard earned dollars to apply for a conditional use permit, come as well prepared as he was, and have the support you folks have shown tonight, is impressive," Murphey said. In other business, the planning commission unanimously approved an application from the local operators of Dutch Bros. to open their second shop in Elk Grove. The second location of the popular coffee-based beverage drive-thru will be on an empty parcel on the northwest corner of Sheldon and Elk Grove-Florin Road in the Sheldon Center strip center. The application moves next to the Elk Grove City Council for consideration. No hearing date for the matter has been established. That's good news. Now I won't have to leave town for my first tattoo.